Single player only. The local and online multiplayer modes from the console version have been removed. No graphics options in game. 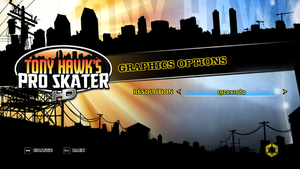 Tony Hawk's Pro Skater HD Launcher enables some missing options. 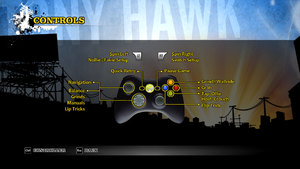 By default, Tony Hawk's Pro Skater HD comes with nearly no customization graphics options on PC. 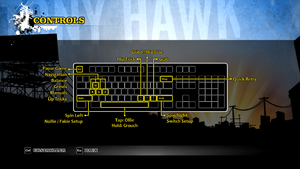 The launcher adds options for rebindable keys, custom resolutions, vsync, windowed mode, and more. Copy Binaries and THHDGame into the installation folder. Use the launcher to customize the game settings. Added in latest Revert Patch; see Widescreen resolution. 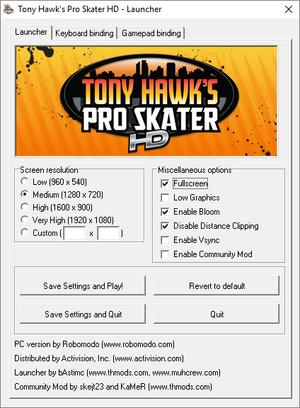 Use Tony Hawk's Pro Skater HD Launcher. Change ResX= and ResY= to match the resolution you want. Save your changes and put the file read only. Change MaxAnisotropy=16 to the setting you want 1, 2, 4, 8 or 16). Hackable by using .ini file changes or the Launcher. 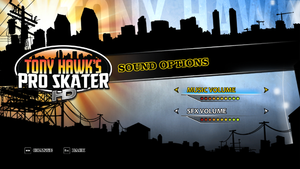 Use Helix Mod: Tony Hawks Pro Skater HD. ↑ 1.0 1.1 File/folder structure within this directory reflects the path(s) listed for Windows and/or Steam game data (use Wine regedit to access Windows registry paths). Games with Steam Cloud support may store data in ~/.steam/steam/userdata/<user-id>/207210/ in addition to or instead of this directory. The app ID (207210) may differ in some cases. Treat backslashes as forward slashes. See the glossary page for details. This page was last edited on 30 March 2019, at 05:12.